RadioIndy is pleased to present George A. Jackson Sr with a GrIndie Award for the CD "Jesus Never Fails"
Gospel artist George A. Jackson SR will inspire listeners with songs of faith and encouragement on his album “Jesus Never Fails.” Jackson’s vocals are soulful and full, which embellish the melodies with style and grace. The title track, “Jesus Never Fails,” motivates the listener with uplifting lyrics and a touch of soul. Get on your feet and clap your hands and let your spirit move you to the rhythmic bluesy feel of “Thank You Lord.” Turning to a different vocal style, “God Is Waiting on You” features Jackson telling a story with spoken words. His words flow with an appealing sensitivity while there is a nice balance within the supporting instruments. 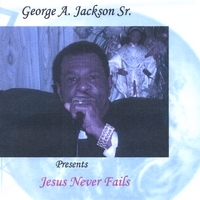 “Jesus Never Fails” by George A. Jackson SR is an inspirational gospel album brimming with thoughtful lyrics and inspiring character and is well worth listening to. George A. Jackson Sr Press Release on Digg.com! "Jesus Never Fails" Reviewed by RadioIndy.com!